For as long as I can remember I’ve struggled reading descriptons of hop flavor/aromas. It’s no secret that smell and taste are extremely subjective, but the liberal use of words that many people don’t have a frame of reference for can be downright frustrating when building hops into a recipe. Catpiss, dank, resinous, fruity, piney, lemony, lemongrass stalk, grass, weed, stone fruit, currants, and the list goes to infinity. I’ll easily concede that there isn’t a more realistic or effective way for us to convey attributes about beer to each other. However, it can be very difficult to read profiles on hops and translate flavors to the final beer. Looking through my recipes it’s quite easy to pinpoint the hops I’m comfortable with and not many others. One thing I’ve done that has been helpful is utilizing the hop aroma/flavor chart. Tracking my experiences with hops numerically has been a great way to quantify why I like certain flavors and what the cause of that flavor/aroma might be. With the explosion of flavorful hops in the past few years I’ve been remiss by not experimenting more and expanding my brewing knowledge by incorporating new hops into my routine. We harp on process and repeat-ability so much as homebrewers, but sometimes we just need to try something different and see where the flavor takes us (maybe I’m learning some from Jeef). With all of that in mind I decided to design an experiment comparing three relatively newer hops and map the results. One of my favorite easy drinking beers is a kellerbier available only on tap at local Prost! brewing. The beer for this experiment is a Kellerpils (style 7C) which I’ve been attempting to dial in since the new style guidlines came out. Kellerpils is a relatively clean quick turn around, lager type beer with a great crsipness to showcase hops. This beer also uses East Coast Yeast Keller bier which I’ve been excited to try since learning of it. To explore the differences between three hop varieties: Mandarina Bavaria, HBC438, and Hallertau Blanc. Brew 14 gallons of kellerpils wort split into three batches. Each batch dry hopped with a separate hop variety. 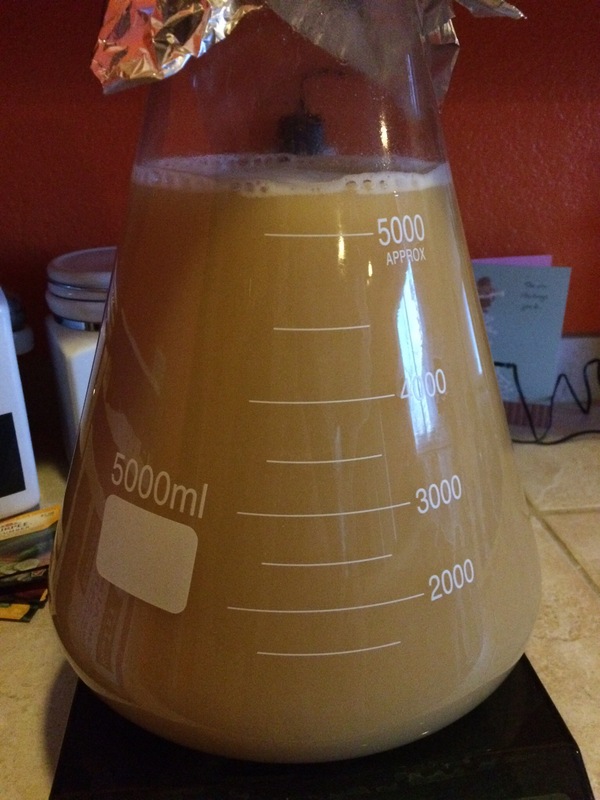 The day before brewing I purchased my ingredients and water, the massive yeast starter had been prepared a few days in advance. The morning of brewing my buddy Dave and I prepared and heated our strike water. 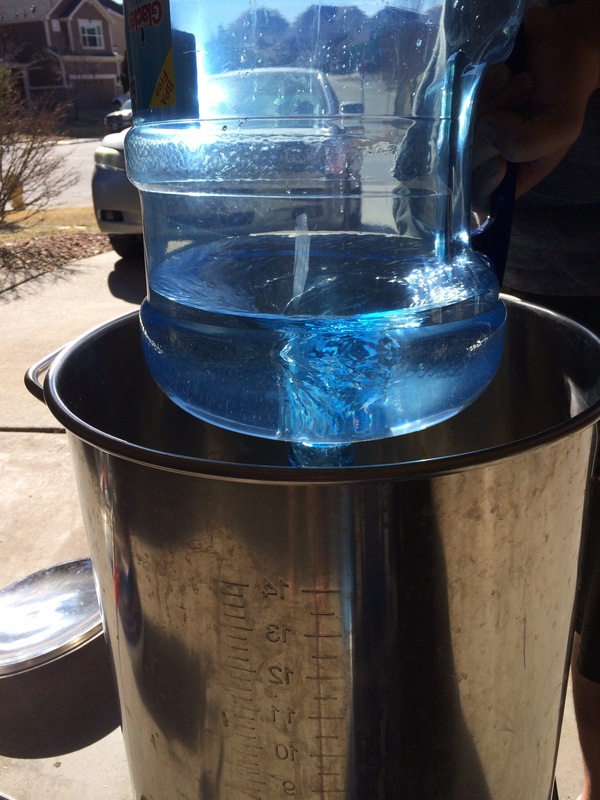 We used a method of creating a whirlpool in the water jug to dispense the water quite rapidly. 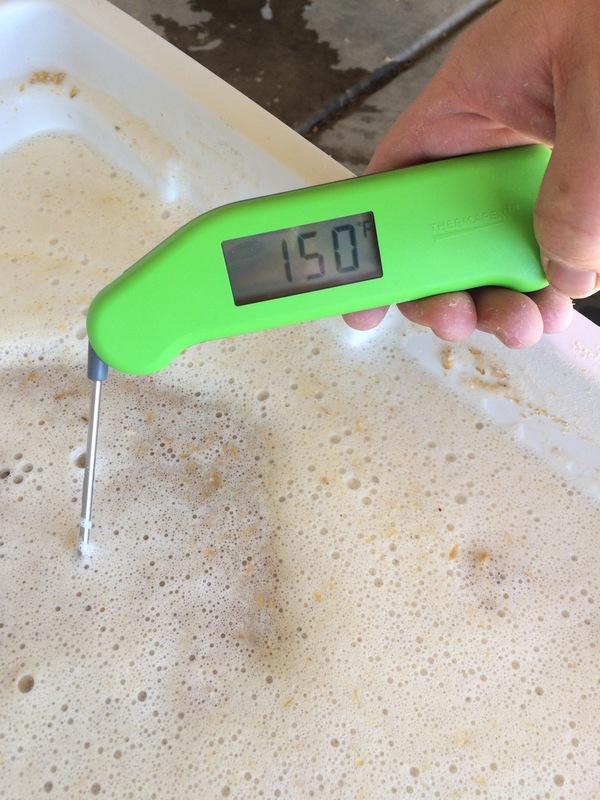 Once the water was heated we mashed in pushing the limits of this 62 quart MLT and hitting our target temp exactly. We mashed for an hour and captured about 18 gallons of wort. The wort was brought to a boil and held there for thirty minutes before a small charge of nugget was added to get to the calculated 38 IBU. After the wort boiled for 90 min we chilled it down semi quickly and split between three corny kegs equally. 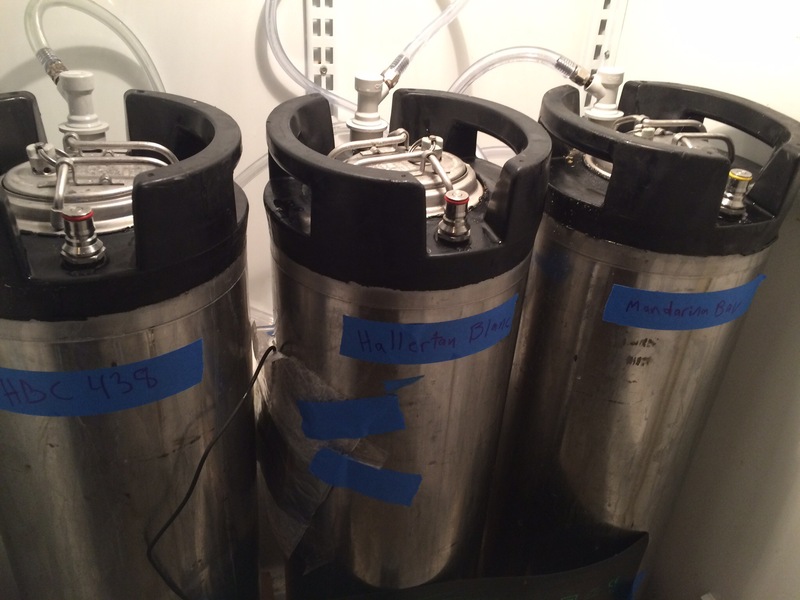 The kegs were labeled and placed in my fermentation chamber set to 48 degrees. Once chilled to 48 the worts were oxygenated for 60 seconds each and equal amounts of yeast were added to each keg along with five drops of fermcap-s. The fermentation chamber was set to 48 degrees for four days and then slowly ramped to 52 before rising up to 60 to complete fermentation. 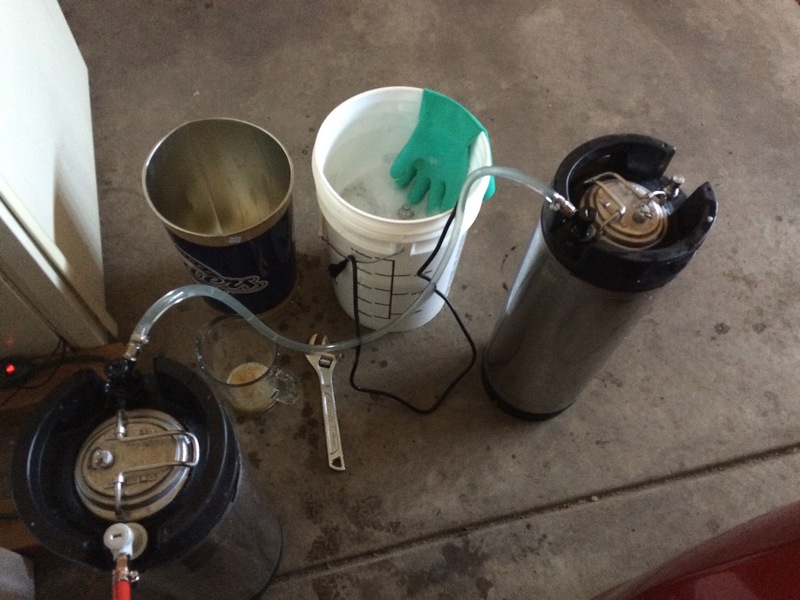 Using corny kegs meant no cool pictures of the beer or fun things happened during fermentation. 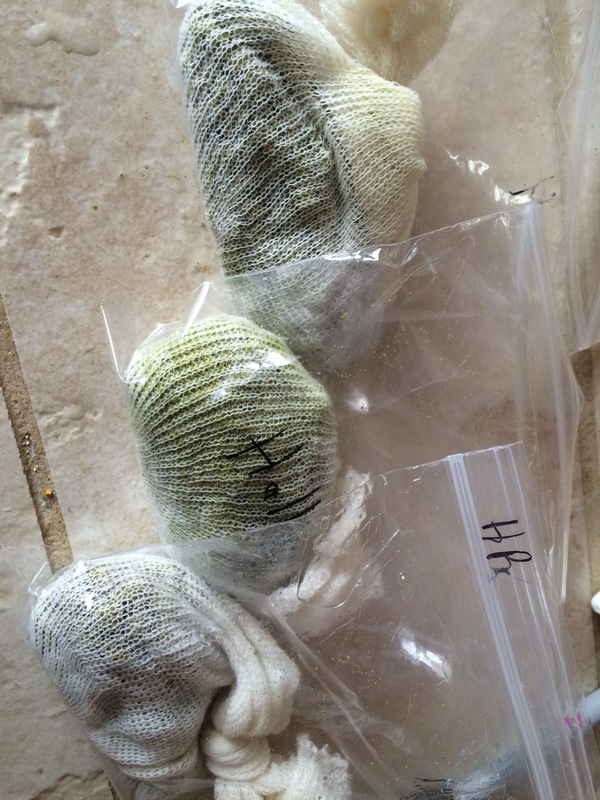 Once the beers were finished fermenting the dry hop sacks were prepared. The sample tasted fantastic and I was almost tempted to forgo dry hopping one keg (if I hadn’t sent in my NHC beers yet I would have). Each sack was sterilized and filled with these wonderfully aromatic hops, purged of oxygen, and submerged for three days. After adding the hops the headspace of each corny was purged with CO2 to prevent potential oxygenation. After dry-hopping each beer was closed transfered to a serving kegged and set to 12 PSI in the keezer. While color appears different in the picture it is simply due to lighting, these beers appear 100% the same side by side. Aroma: Fairly subdued aromatics, hints of tropical fruits, specifically pineapple, white wine like, lemony, slightly vegetal and spicy notes. Taste: Follows the nose, light pineapple notes, with hints of lemon as well, trace grassy/vegetal flavors. Again fairly subdued, there are definite hop flavors in there but nothing really jumps out at you. Overall: A very nice addition to the kellerpils. This is a very pleasant, refreshing beer that doesn’t hit you over the head with hop flavors. This would be a nice late addition to a light summer lager or american wheat in which you are hoping to get a refreshing hop flavor on a crisp canvas. I don’t really see this is a standalone hop. Blended with the HBC 438 in equal portions it provides a roundness of hop flavor which is really nice. Of the three hops this one consistently received the 3rd place vote though everyone thought it was very nice. To me the more I evaluated this hop the more I grew to enjoy it’s subtlety. The white wine flavors are really nice but don’t really jump at you enough to notice unless you sip it. Aroma: Orange! So much freaking orange/clementine aroma. It almost smells like an orange cream soda. Taste: Orange cream soda is by far the most consistent and best description by everyone who has tasted this beer. This hop is bursting with flavors of orange, mango and clementines. It’s not a citric orange either, it’s much more sweet. The cream caramel notes provide a very nice roundness to this hop. Overall: I love this beer. The orange notes mix so well with the kellerpils base beer. I’ve been doing a lot of yard work lately and love sipping on this beer in the balmy Denver spring weather. This hop would work very well as a standalone in late additions for a milk stout and a cream ale or blended in any IPA hopping schedule. I would love to pair this with a vanilla infusion in a cream ale on cask/nitro. Overall consensus of this beer was firmly entrenched in 2nd place of the three examined. There were a few 1st place votes for this one, and it was easily my favorite. Aroma: Just absolutely bursting with sweet notes of mango, slight grape hints. Mango really dominates the aromatics, even as it warms. Taste: Explosion of fruit in the mouth. Tons of papaya, mango, hints of cherry, the hop provides an illusion of pulpiness on the tongue. The fruit taste cannot be overstated with this hop. As the sample warms and it becomes more nuanced there is a slight musty woody and peppery flavor at the end of the sip, its odd but not at all unpleasant. Overall: This was by far the majority of tasters favorite beer. If I wasn’t 100% sure these beers were equally hopped I would say this beer could have easily had double the hops of the other two. This hop can certainly standalone in any type of american pale, IPA, 100% brett beer, etc. An equal mix of the HBC 438 with the INIS913 brett I had on tap at the same time produced a spectacular amalgamation of funk & fruit. As a testament, I actually bought up the remaining HBC 438 at my LHBS after tasting this hop and will be incorporating it with Mosaic and Citra in an upcoming experiment. While I preferred the mandarina given my affinity for orange, this hop had so much flavor I’d be willing to call them 1A and 1B. The blend: Blending these three equally produced a great beer, however, the flavors don’t intertwine to produce something special. Think mango orange cream soda with an interesting spicy vegetal kick. I’m very happy with the results of this experiment. 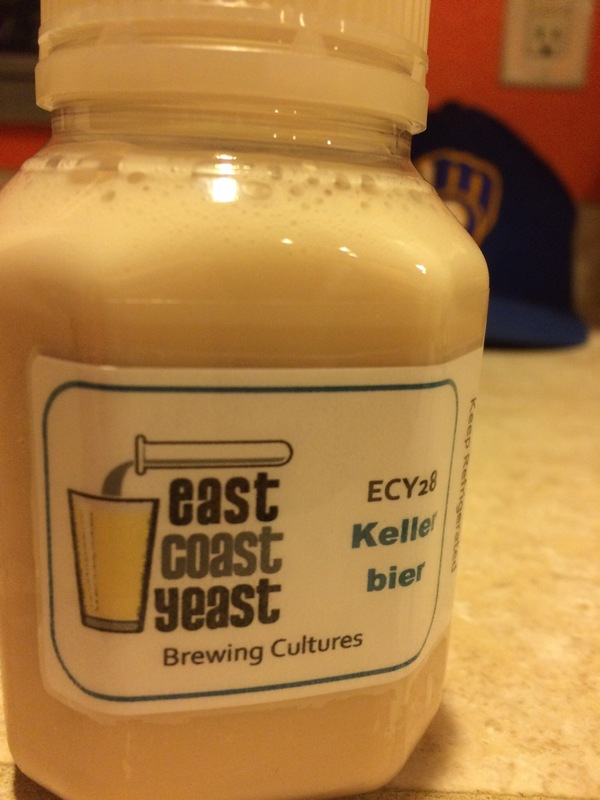 The ECY28 produced an awesome kellerpils. 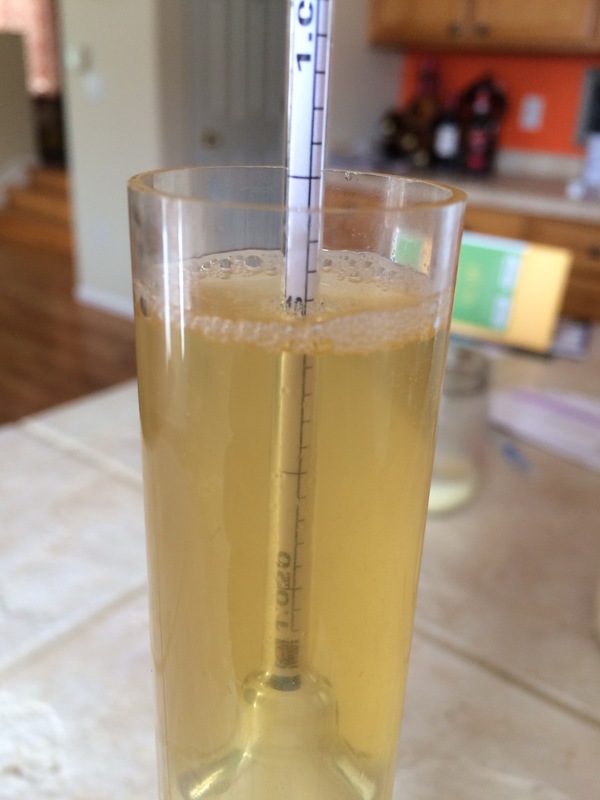 I will certainly be ordering more of this yeast and dialing in my kellerpils for next year NHC. An unheralded style that I fell in love with on a trip to Germany, kellerbier is an unpasteurized, unfiltered, lowly carbonated lager. It’s a style that I hope gets explored more in the coming years after being added to the 2015 BJCP guidelines. The crisp smoothness, and clean refreshing flavors make it a perfect warm weather beer. Finding a quality kellerbier can be difficult given there aren’t many commercially available examples (I’ve only had two: Prost and New Glarus). If in Denver check out Prost’s award winning kellerpils which available regularly at the brewery. In terms of exploring the hops, I couldn’t be more excited. By no way do I claim these hop charts to be definitive, I don’t have the most trained palate and have trouble compartmentalizing my senses to pick up a few of the flavors noted on the chart. That being said, it was quite useful to do this exercise if not simply for the sake of forcing myself to evaluate these hops in depth. Throughout this experiment I’ve gained a new found respect for people in the sensory analysis world. I can’t tell you how many times I poured myself a one ounce sample of these beers and sat analyzing it for 15-20 min tweaking the wheel. Nailing down why things smell/taste the way they do was actually quite difficult. More than once I found myself toward the end of the ounce, sure I had the graph perfectly tailored to my palate, only to suddenly recognize a new flavor/aroma that I hadn’t picked up before. These hops are all truly fantastic and worthy of trying, I am certainly going to incorporate them into some future brews. Cheers! Please feel free to email or comment with any feedback. Our email address is now located on the authors page. Next Process Experiment: Can you Ferment a Sour Beer and a Clean Beer Side by Side? 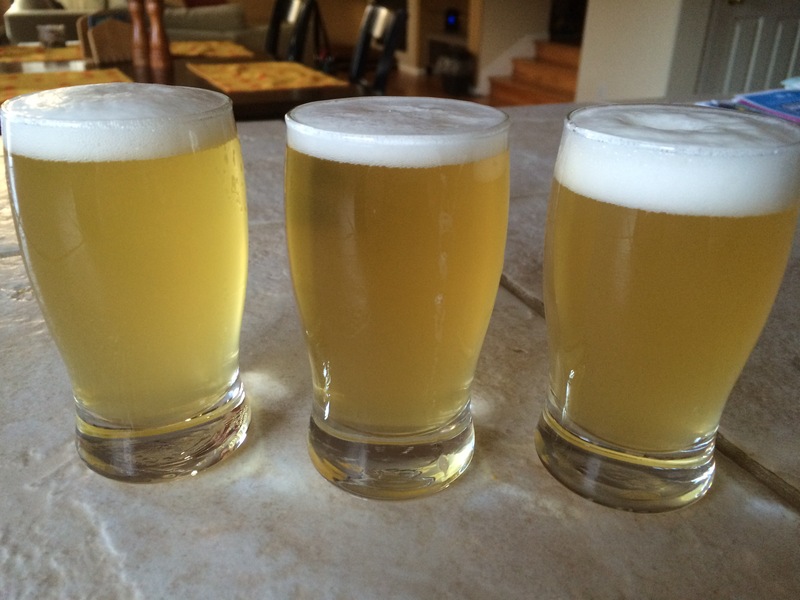 A couple weeks ago I brewed a beer using mandarina bavaria hops for the first time. I paired it with huell melon. The tasting notes from your beer using the mandarina makes me really excited to get this beer finished and try it. Cheers! I love this hop, I’ll probably add it to my actual kellerpils house recipe it’s that good. Thanks for the analysis! I’ve tried Mandarina, which I really like – looking forward to trying HBC 438. I am so glad you used the word “woody” in your HBC 438 description. I said the same thing in my homebrew clubs hbc438 brew comparison and nobody else picked that up. So I plan to post a copy of this for all of them to see! Side note, I was also the only one who would not read anyone elses description of the hop before tasting it myself (in a pale ale, I have since brewed 2 more batches). Ha! Fantastic. The woody notes are certainly subtle and I really only get it as the sample warms and degases some. When it’s colder and full of co2 the aromatics are so fruit heavy it just drowns the woody/peppery notes. I’ve found that if I’m not highly scrutinizing for flavors I just find the dominant flavor so I wouldn’t fault them for not picking up on it. I’m a big fan of both Hallertau Blanc (which I thought of as a grassy, floral, mellon kind of character) and HBC-438 (which I thought of as super orange soda). But man, $3.99/oz–oof! I brewed with my HBC-438 from the NHC Seminar. Love that hop. I perceived it to be huge in aroma with notes of mango and peach. Can’t wait for it to be more available. While i haven’t tried it yet one of my friends says it’s quite good and really captures the hop character. I was very impressed with 438 overall, really good hop. If you make it up to Fort Collins check out Zwei Brewing. They often have a great Kellerpils (and currently a Keller helles) on and often dry hop different versions. One with mandarina and lemondrop – amazing.